Scaling WordPress is a hot topic among developers. For some, it’s just something you do through a variety of tools and practices that you learn over time. For others who are involved with development in other languages, it’s a fool’s errand. As far as I’m concerned, WordPress does scale though it takes some strategies to get it to work (such as a proper use of transients, caching, etc.). But there are varying degrees of what it means “to scale,” right? That is, depending on how many users you have, the type of content you’re serving, the level of demand your site has based on the interaction of the visitors, and some other factors will all contribute to whether or not your site is going to scale. But if we’re working on a larger project and we know it’s going to need to scale, how do we know we’re doing everything correctly? Generally speaking, when it comes to “scaling WordPress” we’re talking about making sure WordPress gracefully handles a high volume of demand. What constitutes “a high volume of demand” really depends on your project, so your mileage will vary based on what your site is doing and how many people are visiting. Regardless, the team at Pantheon has put together an awesome resource for those looking to learn how to work on scaling WordPress projects. WordPress is moving upmarket, powering high-traffic, mission-critical websites. 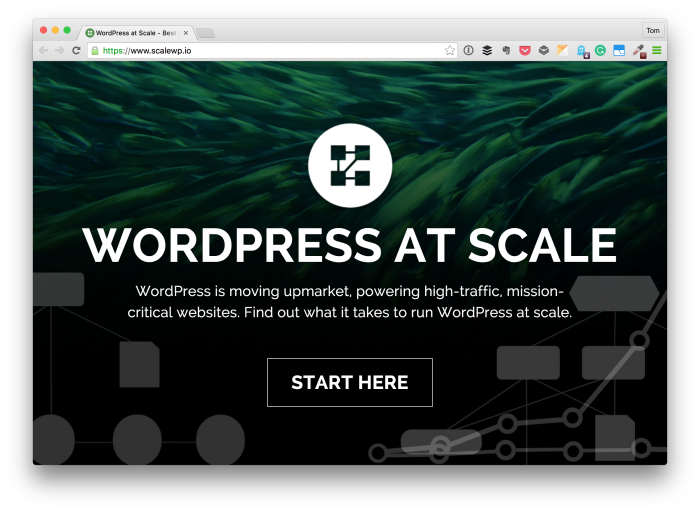 Find out what it takes to run WordPress at scale. And I’m sure there’s more to come as the project is open source. Whether or not scaling is something you’ve never had to worry about, something you’re interested in learning about, or something that you’re going to need in an upcoming project, this site is one worth reading and referencing. It’s things like this that go to show not just how powerful WordPress is, but how much there is to learn when running large WordPress-based projects. I didn’t know about this before, thanks for sharing. I was so happy that they posted this resource. I’ve been working on an Ansible project to allow the community to have servers like that. The issue I was running into is no one was sharing how they were doing things so I’ve been left to piece the different blocks together myself. It’s great to see a service provider give a high-level overview of the different components. I’m in full agreement with you (shy of Ansible — I mean, I’m not using it for anything right now). At the same time, there are things that I’d like to see grow overtime. Don’t get me wrong, it’s a great resource, but it’s definitely 1.0.0. For sure! But I’d rather have some version 1.0.0 over nothing. I want more people to share that stuff. I’m trying to get the ball rolling myself. That’s going to be my talk at WCSD. Agreed – 1.0.0 all the way. I hope I can hear your talk at WCSD.